Last Friday we launched the boat from Kawakawa Bay at daybreak and headed for Terikihi Rock. We wanted to test the new floating bead traces on our Boat Longline. The first set was 25 hooks with 12 floating beads traces fitted. This set was the best of the day. We caught six snapper, the largest fish was hooked on a floating bead trace. The rest were on standard hooks. On the second set we caught two fish. A 4lb snapper was hooked on a floating bead trace and the trevally pictured was on a standard one. I will keep testing the floating bead traces, however I think their strengths will be noted more on kite fishing. The set I did on the Manukau on Wednesday saw the floating bead traces more often twisted around the hook section.This was due to tidal stream. The catch of gurnard, lemonfish and one snapper were evenly caught on both floated and unfloated traces. The only snapper was caught on a floated bait. Ed: It is great to have such great photos to put in the newsletter. Paul Major is a regular contributor of great pics and detailed reports. Don't forget to take your camera next time you head out fishing and send in your report. New maritime regulations which could affect kite and kontiki fishers in the area from East Cape to Wellington are to be introduced nationwide over the next few months. The new regulation, MSA rule 91, if given strict interpretation on it's own, will not only affect kite and kontiki fishing but also will affect commercial or recreational crab pots, cray pots, set nets, mussel farms, longlines and any other fishing equipment in the water. We have checked with the MSA legal advisor Tim Workman and Ian Lancaster. Rule 91 relates to people not being able to place any obstruction, including any fishing apparatus, which unduly restricts navigation or is likely to cause loss of life or injury to any person or damage to any vessel or any property. Rule 91 was originally proposed to deal with nets being set across busy channels. Tim says it is open to debate whether it applies to kites or kontikis. Flags on kitelines could be construed as an effort to minimise the likelihood of damage. MSA Rule 91 has not been signed off by the Minister and is not likely to be in force till January 2003. Rule 91 only applies if the local regional council does not have a bylaw in their own set of rules. Local regional authorities all around the country are standardising their bylaws regards maritime activities. Napier's new bylaw (bylaw 2.7) is expected be effective as of December this year. To balance rule 91 vessel operators are required to maintain a watch at all times. This means that if gear is clearly marked the vessel must take action to avoid colliding with the marked gear. The new rule appears to favour trawlers, seine vessles and scallop dredgers, as these methods require the whole of the water column over the whole of the distance the vessel travels while fishing. Fortunately most areas have trawl exclusion zones in the inshore areas where kites and kontikis operate and there is no scallop dredging on the west coast. On the down side the area from East Cape to Wellington has no trawl exclusion zone. Kite and kontiki fishers who have poorly marked gear in this area in particular are at risk from trawlers. Kite and kontiki fishers in all other areas should also take note of the new rule 91. This rule applies to any gear in any area, so be aware of the possibility of recreational or commercial vessels in the area you are fishing. Paul's Fishing Kites will be closely following the implementation of rule 91 and will keep you informed of any developments. In the meantime use common sense, avoid fishing in areas near boat ramps, navigation channels or where other recreational activities could cause conflicts and ensure your gear is clearly marked. If you see a trawler heading towards your gear, haul it in. Trawlers only travel at around four knots when fishing which should give you plenty of time to get out of their way. Above all keep a good lookout! The attached weather report is a sample of what metservice are now sending to me every day. This is so I can get up to the minute information on the weather. As you can see from the report we are experiencing south to southwesterly winds up to 25 knots with a 3-4 metre southerly swell. This weather pattern arrived last Saturday and has been with us ever since. With the wind and the sea coming from the same direction it has not being suitable for kite or kontiki fishing. This is unusual, normally in a southwesterly we can easily set any kite or kontiki out. Our Snapper and Gurnard Fishing Contests are underway. The leading fish to date are a snapper weighing 1.36kg and a gurnard weighed in at 1.58kg. I am expecting both of these fish to be superceded by bigger fish. It is easy to enter the contest. Bring the fish you have caught from Porangahau Beach into the shop and we will weigh it for you. Entry is free and we have some great prizes up for grabs. I even have a digital camera handy so I can take a photo for you. Call the shop or drop in and see us for more details. With these new daily weather reports I will be able to tell you exactly what is happening on the beach and what is expected for the rest of the day. The Trevally Hunt on the Manukau is well underway. The graph below is an illustration of the fish we have caught while Mark and I have been fishing together over the past year. I have been testing the 4/0 Target Snapper Hooks on light traces against any other hook Mark chooses to use. 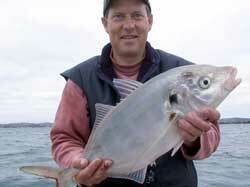 We caught ten trevally and one kahawai last weekend over a couple of hours fishing. All the fish were caught on shellfish baits. The good news is the trevally are slightly fatter now and in better condition with good roe. The biggest we caught measured 490mm long. We decided to check out what the kahawai had been feeding on. In it's guts were four whole piper. Two of the piper were quite big. All were fresh and perfectly skinned, they almost looked edible. As mentioned last week the Kite Fishing Club held their annual away fishing trip two weeks ago. Based in Ahipara they had the opportunity to fish any of the Far North beaches. David Billings, Jamie Cullen, Don Griffiths and Jim Birch all fished Rarawa Beach. Snapper, one big moray eel and a stargazer were landed from the Bottom Longline Rigs. The best snapper weighed 6.2kg on the beach but by the time David got the fish to the weigh station the next day it was 5.9kg. 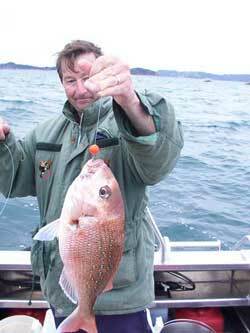 Most of the crew fished Tokerau Beach on Saturday and all caught snapper, Tony Talbot even managed to land a couple of gurnard. Tim Gerard caught eight snapper with his Flexiwing Rig which was the most fish caught by one fisher and the best weighed 2.8kg. Mel Riley and Kevin Griffiths fished at Hendersons Beach. Mel landed a good sized john dory with his Flexiwing Rig. Kevin caught snapper and even a parrot fish from his 65kg Dropper Rig. On Sunday the club members headed to Tokerau Beach for the day. Another productive day's fishing for everyone with David Billings and Mel Riley catching six snapper each. Emma Howard-Smith landed the best snapper of the day, this weighed 2.5kg. The club members caught a total of 62 snapper, six gurnard, two moray eels, one john dory and a parrot fish. Everyone enjoyed themselves and are looking forward to the next day out with the club. If you want to be a part of this fun contact the Kite Fishing Club. I went kitefishing at Matata in the Bay of Plenty last Friday. I caught two snapper using my kite powered Bottom Longline. I put out one set of 24 hooks baited with squid. There was a strong southwesterly blowing at the time and an incoming tide. Still Using the Old Clips? Find out why you should be using our new Coastlock Clips for improved security and reliability. The new Coastlock Clips are easy to use and are great for any existing kitelines or boat longlines. You will find it hard to find a better clip anywhere. Reasonably priced and twice the strength as the old clips. Click here to find out more about the improved clips.